The St.Vincent and the Grenadines leg of the programme, which has the blessing of the West Indies Cricket Board and the St. Vincent and the Grenadines Cricket Association, will commence this Saturday at three venues: Buccament Bay, North Union and Arnos Vale playing fields. Males and females between 12 and 17 years old will be the beneficiaries of the initiative. 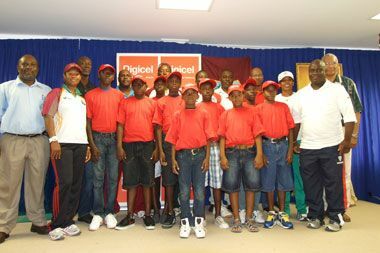 The programme dovetails the Scotia Bank Kiddy Cricket programme, which is designed for children 6 to 11 years old. The Grassroots programme targets the Under 15 and Under-17 classes, which will be split into two separate groups. Each progamme spans 12 months with participants being engaged in classroom and field training. The programme will also provide exposure to the fundamentals of cricket. Development Officer for Cricket in St. Vincent and the Grenadines and the Windward Islands Irvine Warrican told SEARCHLIGHT that, at first, there had been a limit of 90 participants, but that restriction was lifted to allow any number of interested persons. Warrican said that an integral component in making the programme a success, is the involvement of parents. âWe plan to organize foundation courses for the parents of the participants, so that they can assist the children while they are at home,â Warrican disclosed. âThere will be a theoretical part where we will be dealing with the history of West Indies Cricket, Conflict Resolution, Sports Injuries, Nutrition, advising them of what to eat, exercise and so on, â Warrican added. The Cricket Development Officer said that in these modules, personnel will be brought in as facilitators. Warrican identified Orlanzo Jackson, Deighton Butler, Juliana Nero, Bertram Stapleton, Samantha Lynch and Kenroy Peters as some of the coaches who will oversee the clusters. Warrican said the St. Vincent and the Grenadines programme has received 180 jerseys for the participants and polo shirts for the coaches. The WICB will provide each group with a start up kit comprising two bats, two pairs of batting pads, two pairs batting gloves, two helmets, one pair wicketkeeping pads, one pair wicketkeeping gloves and six balls. Warrican, a former St. Vincent and the Grenadines and Windwards off-spinner, said that dependent on the needs of each group, additional equipment and gear will be provided to enhance the training programme. Speaking at last Saturdayâs launch, Jerry George, Public Relations Manager of Digicel said that the Grassroots Programme â is a long term succession plan for West Indies Cricket, aimed at ensuring sustainability at the national and international levels by creating a pool of skilled young players, who will further drive the growth of and success of the gameâ. Meanwhile, President of the St. Vincent and the Grenadines Cricket Association Julian Jack said that grassroots Cricket has always been around, through socialization practices since in his day, where every patch of land that was unused could have been transformed into a cricket field, or someoneâs back yard or the road, when there were fewer vehicles and houses. He said that the WICB/Digicel programme takes Cricket at that level, through a more organized and systematic path of development. Director of Physical Education and Sports Nelson Hillocks and Elford Charles, representing the Ministry of Education, also gave brief remarks at last Saturdayâs launch. In addition to St. Vincent and the Grenadines, Trinidad and Tobago and the British Virgin Islands, the programme in being carried on in Antigua and Barbuda, St Maarten, St Kitts and Nevis, Barbados, St Lucia, Grenada, Dominica, Jamaica and Guyana.